2.5 billion people – that’s around 2 in 5 people around the world – do not have access to basic sanitation such as toilets or latrines. That means they can’t go to the toilet when they need to – they have to plan and wait until they can go somewhere private enough. For many women, it means waiting until after dark – and risking being attacked, just because they need to go to the toilet. And the lack of toilets in poor communities spreads diseases of insanitation – diseases that could be prevented, and which kill millions every year. CARE works around the world with communities to increase access to latrines and improve hygiene to prevent disease and keep people healthy. It’s not about helping people relieve themselves. It’s about giving people back their dignity. It’s about giving people the chance to lead healthy lives. It’s about giving women the chance to feel safe. 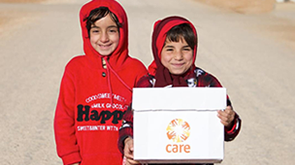 CARE works on water, sanitation and hygiene (WASH) in emergency situations, and provides long-term solutions for poor communities. We respond to outbreaks of water-borne diseases such as cholera by distributing hygiene kits containing soap and disinfectants, and by running hygiene promotion sessions. In 2014, our hygiene promotion work with communities in Sierra Leone and Liberia helped give communities the knowledge and ability to contain the spread of Ebola. We help provide latrines and basic sanitation in refugee camps and camps for internally displaced people fleeing from conflict or forced to leave their homes by drought, floods or natural disasters. We provide hygiene training so women, men, boys and girls know how to avoid picking up or transmitting diseases. We support communities to build and maintain safe water and sanitation systems, and empower the users of these systems – particularly women – to have a say in how they are used and maintained. Read how CARE is coordinating its emergency response in the first days after the earthquake.